ISLAMABAD: Prime Minister Imran Khan on Saturday said that former president General (retd) Pervaiz Musharraf gave a NRO to former prime minister Nawaz Sharif in the Hudaibiya paper mills case. In a meeting with Information Minister Fawad Chaudhry, the premier said that had the decision on Hudaibiya case was given on merit, it would have ended money laundering the country. 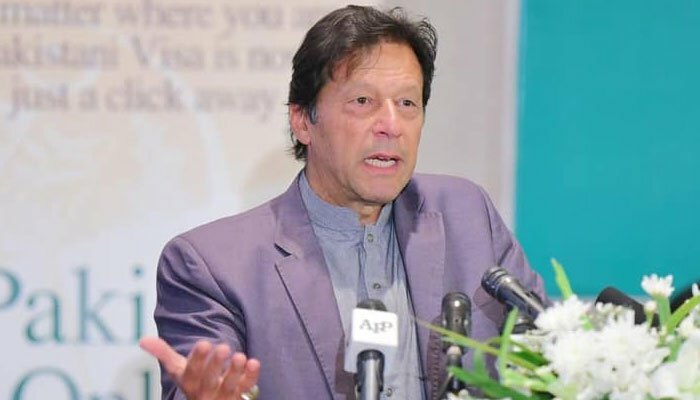 PM Imran said that all money laundering cases have used the Hudaibiya model by sending money abroad through frontmens - and then brought back the money - he alleged that Nawaz Sharif and Zardari whitened their money through the tactics. He said that the country is stuck with inflations and foreign loans. "We had taken $60 billion in loans in last 10 years. People responsible for it should be held accountable," he said. The Hudaibiya Paper Mills was allegedly used as a cover by the Sharif family to launder money outside the country in the 1990s. It was in relation to this case that the Sharif family's trusted aide, Ishaq Dar, recorded a confessional statement on April 25, 2000 in front of a magistrate in Lahore accepting his role in laundering money. On the basis of that confession, a reference was filed by the NAB in 2000 before an accountability court against the Hudabiya Paper Mills, three Sharif brothers, Dar and others. Dar was not charged as he had become an approver for the prosecution. That reference was struck down by a referee judge of the LHC on March 11, 2014 in response to a writ petition filed in 2011 stating that Dar's confession was coerced. Dar had claimed that he had made the 'confession' under duress and disowned the statement.